Ringtones have been in as long as mobile phones were, or we can say that they were in market long before the cell phones have arrived though they still remain the top most priority for those people who want to make their phone customized and set them according to their personal liking and interest. If this sounds like you then to find the best ringtone app is certainly not a hard work. Luckily we found an app for free ringtones which you should check out to save your time finding an app for yourself. To download custom ringtones were not that popular before as they are now because it's easier to find them. Surprisingly, the market for Android ringtone apps to find ringtones, notification tones, and alarm tones isn’t as vibrant as one would believe. A trustworthy app like "Mobiles Ringtones" which is easily available on Play store which gives access to download as much ringtone you need to make your device look more customized. This app is developed by Watermelon Tech and is running with a current version 1.23 and has downloads over 1000,000+ on Android smartphones. This is the only app which has special tagging features to locate your desired ringtone, the app is also co-related with its website https://www.mobilesringtones.com. If you like cool ringtones and you would like to have personalized ringtones for Android; this is the right ringtones app for you. In this app you will find mobile sounds that can be used as ringtones for cell phones, message tones and alarm sounds. 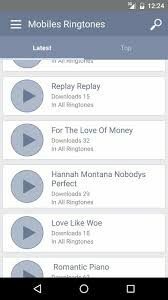 Customize your phone with latest ringtones with this app your will definitely find the best sounds placed in different categories; download popular ringtones free today and enjoy the most popular ringtones app!